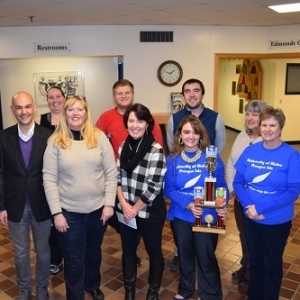 Representatives from both institutions gathered on Nov. 18 at NMCC for a special ceremony to announce this year’s winner and award the coveted soup can trophy. Dixie Shaw, Catholic Charities Hunger and Relief Services Program Director, was on hand to make the announcement. Together, the institutions collected enough food and money to equal a combined 6,596 pounds of food. Shaw announced that NMCC had collected 3,167 pounds of food and UMPI had collected 3,429, so with a margin of only 262 pounds, UMPI was named the winner. This year’s event far surpassed last year’s successful event, when a total of 1,536 pounds of food was collected. The idea for this unique food drive was hatched in Fall 2014 after UMPI’s Registrar Kathy Davis learned about the efforts underway in Maine to celebrate Hunger Action Month, a nationwide campaign in September that mobilizes the public to take action on the issue of hunger. Davis came up with the idea to challenge NMCC to a food drive, a small committee came up with the “food fight” theme, NMCC officials were approached about the idea, and then both campuses took up the effort. This year, organizers opted to kick off the event on Oct. 16 in honor of World Food Day, as well as World Hunger Action Month during the month of October. The friendly competition between UMPI and NMCC continues to support hunger awareness and combat local food poverty issues in a meaningful way. UMPI’s Houlton Higher Education Center also participated in the competition. Students from NMCC and UMPI who utilize the facility were encouraged to bring canned goods and non-perishable items to the Center. Other members from HHEC, including students from University College at Houlton, Adult Education Houlton/Hodgdon, and Carleton Project, as well as community visitors, also participated in the challenge. 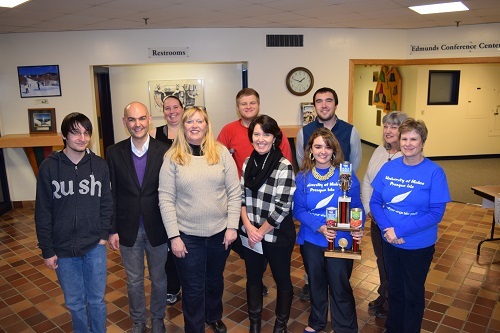 A “Coffee Break” celebration was held at the Center on Nov. 12, with a trophy awarded to the school with the most collected donations. Coffee and donuts were provided and a tally determined UMPI as the trophy recipient. Otis Smith, Director of the Houlton-based NMCC program, reluctantly relinquished the trophy awarded to them last year to Tracy Rockwell, Director of HHEC. Roger and Kathy Dyer, representing St. Mary’s Food Pantry in Houlton, were present to receive the donated goods and were also presented with $30 in cash donated by students. The Houlton Center gives its appreciation to Andy’s IGA and Marden’s for their contributions to the event.